Pinhead is back. Or rather Magnus "Wolverine" Persson is back with another Hellraiser case mod. 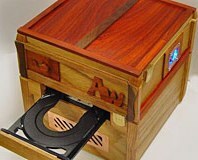 This time he has remade his original Puzzlebox the way he originally intended. Who says all Hollywood sequels are rubbish? The game has only just been released but we already have our first Guild Wars Factions case mod. Take an old quad-processor server case, strip it down, airbrush it up, watercool it and you have one top case mod. Our friendly neighbourhood Engraver, Micke Gustafsson, is back. This time he's engraving a Spiderman-themed case for his son. With great power(tools) comes great responsibility. Think of the modded cases at your favourite LAN Party and imagine what will be at Dreamhack Winter 2005, the world's largest LAN party, in Sweden next week. Micke Gustafsson previews the event, and details the seven custom cases he will be displaying.